Tired of straining your eyes to read books? Maybe you are tired of squinting at the small print on road maps? Whatever your reason may be, the Jobar LED Hand-held 4 X Magnifier will take the ‘small’ out of small print. We understand the frustration when you need to pull over in the car and struggle to read a road map in the dark. This LED magnifying glass ensures you can eliminate any potential inconvenience as the 5 bright LED’s perfectly illuminate the magnified area making it hassle free to read. 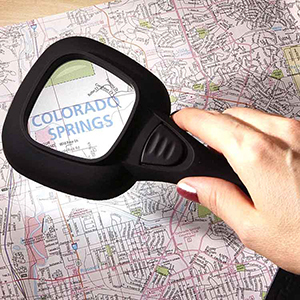 Compact in size, this powerful magnifying glass will slot comfortably into your handbag or glove compartment of your car to quickly pull out when you need it the most. With a magnification of up to X 4 this glass will ensure you can comfortably read even the smallest of print, be it text on a page or those intricately printed road maps. The handheld magnifying glass boasts a comfortable, ergonomic handle and is also great for jewellery making/fixing, arts and crafts and anything else that you can benefit from having a better view of. TWO LED light functions make this glass magnifier the most versatile, user friendly magnifying glass ever! Slide the switch up to use the five small LED lights. This feature will light the entire area below the lens. Slide the switch down to use the LED focus light. This feature will allow you to light a specific area under the lens. The switch must be placed in the middle to turn the LED lights off.